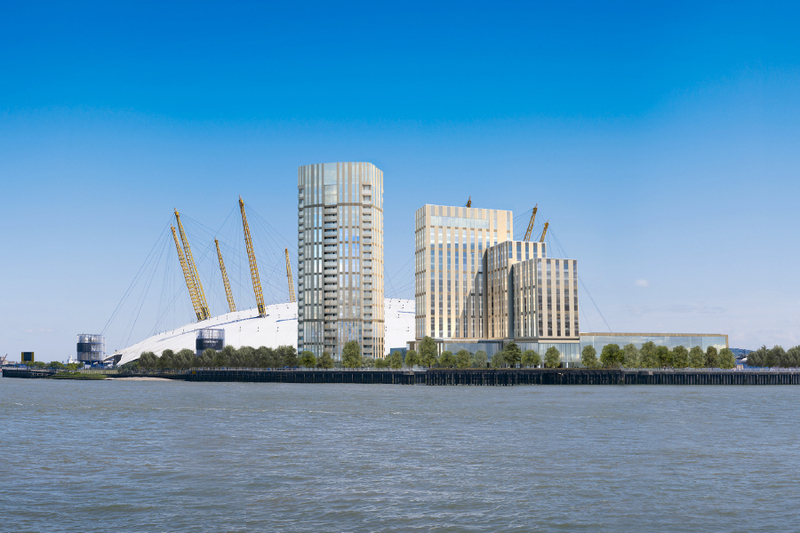 The project is a proposed 450 bedroom five star hotel and forms part of the Greenwich Peninsula redevelopment. Connected to the hotel is a 2,000 person banquet and conference centre, which contains roof trusses spanning over 40m to provide the largest clear span banquet centre in London. In addition to this, the development also includes a private, 24-storey residential development. Fairhurst were engaged directly by the developer to carry out the design works and were then novated to the successful Design and Build Contractor. The site is a former coal burning power station with a 100m diameter tar pit directly below the conference centre. Remediation strategies and technical approval for the groundworks required a detailed study of the history and physical investigation work over a number of months. A post tensioned concrete slab solution was developed to accommodate the recessed bathroom pods and to provide a ‘stiff’ slab edge for the stone cladding panels. Driven piling was designed to minimise the soil arisings and significantly reduced the amount of contaminated material to be removed from site. Fairhurst worked closely with the design team to value engineer the superstructure. The construction programme demanded a high level of off-site fabrication with cladding and bathroom pods quickly agreed as the most economical construction option, in order to complete the project within two years.